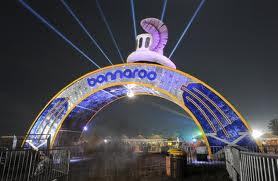 The first Bonnaroo Music Festival was held in 2002 to showcase the talents of emerging and popular artists, performers and comedians. Since then, the festival has grown to become one of the largest music and camping events in the country and is the only round-the-clock music festival in the United States. The festival originally featured jam bands, but now accommodate solo artists, pop performers and world-renowned comedians. In 2008, Rolling Stone magazine called the Bonnaroo Music Festival "the ultimate over-the-top summer festival."